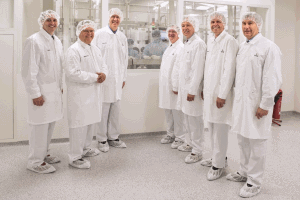 Ravensburg, Germany, April 17, 2018 / B3C newswire / -- Vetter, a global leader in prefilled drug-delivery systems was paid a special visit today at its Ravensburg, Germany facilities by Illinois Governor, Bruce Rauner. The governor was accompanied by a delegation of approximately twenty key state and county representatives including notable Illinois economic institutions and organizations. Together with Vetter management, the contingent discussed present local and global economic issues affecting manufacturing and trade. The delegation was also given a guided tour of one of the company’s aseptic production sites and its center for visual inspection and logistics. Over the course of the visit, Vetter outlined the status of its site for injectable development services in Skokie. The current 37,000 sq ft facility at the Illinois Science+Technology Park is presently undergoing a further expansion of more than 12,000 sq ft which includes storage areas as well as office space. This expansion is due to the continuous increase in customer demand, and consequently, an increase in project work within the early clinical development of injectables. In addition, Vetter reviewed its future plans for the company’s Des Plaines property. The pharmaceutical service provider completed the purchase of the 18-acre site in Des Plaines in 2017 as an integral part of the company’s ‘one stop shopping’ initiative, enabling a fast project start-up upon completion of cooperation agreements with customers. Initial renovations at the site are complete. Most recently, office space for Vetter’s US Key Account Management, Human Resources and Legal departments was equipped and is now ready for use. Headquartered in Ravensburg, Germany, Vetter is a global leading contract development and manufacturing organization (CDMO) with production facilities in Germany and the United States. The company, which currently employs 4,400 individuals worldwide, has long-term experience offering services ranging from early development support including clinical manufacturing, to commercial supply and various packaging solutions for vials, syringes and cartridges. Vetter’s customers range from small and midsize to the world’s top 20 pharmaceutical and biotech companies. As a leading solution provider, the CDMO recognizes its responsibility in supporting the needs of its customers in developing devices that contribute to increased patient safety, convenience, and enhanced compliance. In addition, the company places high importance on social responsibility including environmental protection and sustainability.